I've been toying with a timesaver module before using Bauspielbahn parts. Last year I started to build an N-scale version. That project fizzled after a while, and the module was stored in the garage for most of last year. 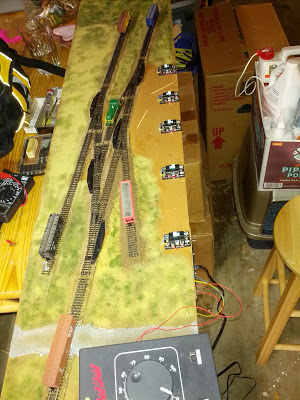 The baseboard is only 1 x 5 feet, so it wasn't much in the way, and, as can be seen on the photo, that leaves plenty of space for "scenery". The module is fully wired up and operational. The Rapido couplers on my existing N-scale cars were not very good for switching, so I installed Microtrains trucks with knuckle couplers to match the little Diesel switcher. Replacing the trucks was reasonably easy on most cars. This afternoon I sat down for a little while, cleaned tracks, hooked up power and indeed, the little thing actually works. It has some minor connectivity issues that should be easily fixable with some soldering and a couple extra power feeds. Now, ... the point of the Timesaver is to act as a switching puzzle. I needed a way to define where cars are supposed to be spotted. I used Lego bricks on the Bauspielbahn-Timesaver a few years ago to give each car a color identity, and randomly placed matching Lego bricks at the loading spots. 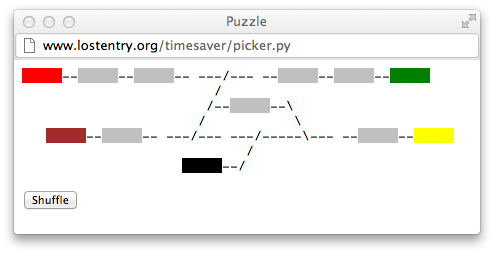 For the N-scale version I wrote a script that shuffles assignments and delivers the result on a Web page in ASCII art. Not pretty, but functional and perfectly sufficient for the purpose. Each car has a distinct color, which makes spot assignments very simple. Using the switcher locomotive the operator moves cars to their assigned spots. Then we start over.